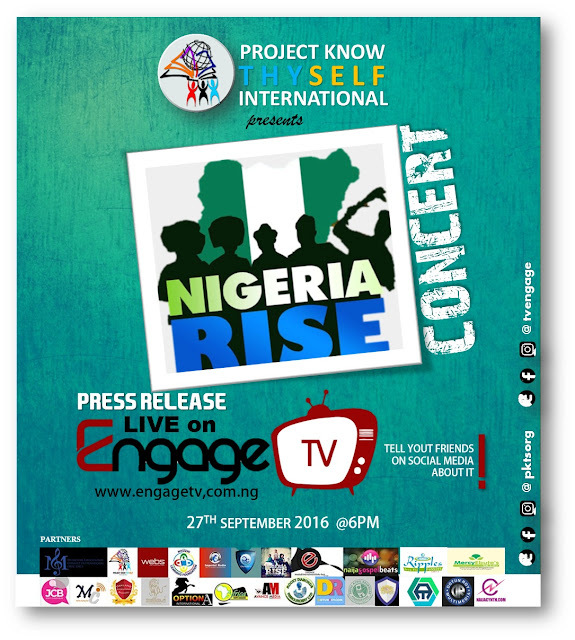 Nigeria's biggest Independence show , the Nigeria Rise Concert holds on October 9, 2016 at the Sheraton Abuja Hotel. This Concert being powered by Project Know Thyself International in partnership with AGN, DJ's Association, Abuja Comedians Association, Nigeria Police, Bloggers In Abuja and many Media platforms is said to be the mother of all shows as all roads will lead to Abuja to showcase a way forward with hope for Nigeria. The hosts unveiled a few days back include AIT's Adaora Onyechere, and WE fm's Stanley Bentu. Speaking to the organiser, Frankie Giva, he expressed hope in the Nigerian brand and tasked Nigerians to come out enmasse and commit to a better future for Nigeria with a commitment to contribute their quota. Follow the conversations on all social media platforms and do not forget to watch the online press conference via Engage TV: www.engagetv.com.ng on Tuesday Sept. 27, 2016.